Q. Who has the cutest dimples around? Yesterday was Thanksgiving Day. What are we most thankful for this year? Why, Theodore, of course! Yesterday, we started the day with a baby photo shoot on the couch. Later, the Jackson branch of the Official Theodore Hains Fan Club stopped by to ooh and ahh over baby. During the afternoon, Memere did lots of snuggling (and no fewer than three diaper changes, too!). After dinner, we played Outburst and Password with Auntie Sarah and Uncle Corey. 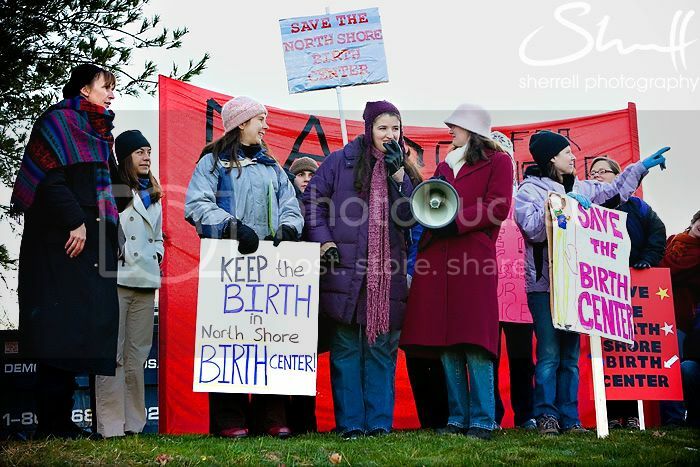 Theo came with us to yesterday's rally to save the North Shore Birth Center. Tyler kept him snuggled under his jacket the whole time, in a baby sling, while I scurried around, talking with media and leading the crowds. Why, it's a blue baby hat. Theo's in there! I haven't been posting much lately because I've been hard at work on the Campaign to Save the North Shore Birth Center, which I've been spearheading. Theo came with me to the Campaign's organizational meeting on Sunday morning. He's a little activist in the making! In other news, my mom has been saying that Theo looks bigger in photographs than he does in real life. When she comes to visit, she spends a few minutes marveling at how small he still is! So, here is a photo orchestrated to show off Theo's teensy, then-six-week-old cuteness. Our friend Tom and I present: Theo with a contrabassoon! Hm, it looks like he's getting ready to smile! Is he? Oh, yes, he is! That's our baby--a sweet-natured sunshine boy.